A city daily is celebrating after it successfully campaigned to keep international football on its patch. The Glasgow Evening Times launched its ‘Save the Hampden Roar’ campaign last year after it was first mooted that the Scottish Football Association could move Scotland national team matches and showpiece finals away from the city’s Hampden Park stadium. Since then, the Evening Times has provided a platform for those who oppose the move to get their message to the SFA – with public figures including Glasgow City Council’s leader and the chief executive of Glasgow Airport adding their voices to the campaign in recent weeks. The Evening Times splashed on a final rallying call for the campaign yesterday, and this afternoon the SFA announced it would be staying at Hampden after agreeing to buy the stadium. 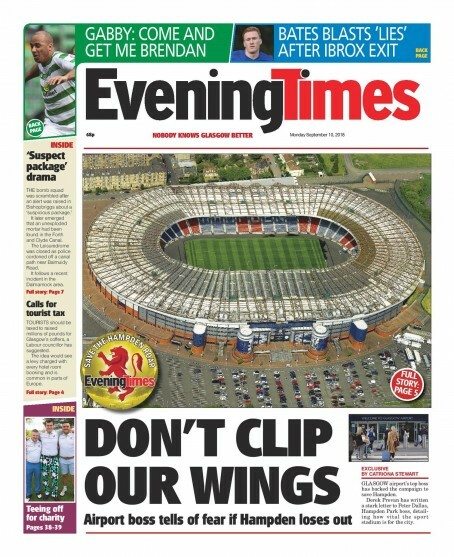 Henry Ainslie, deputy editor of the Evening Times, told HTFP: “As soon as the SFA suggested the potential move away from Hampden, the Evening Times joined the chorus of opposition by launching the Save the Hampden Roar campaign. “Nobody in Glasgow wants to see the Scottish football team move away from the famous stadium – Scottish football’s spiritual home – and as a champion for the city we are duty bound to ensure the SFA hears the voices of those against any potential move. “Since we launched the campaign, important voices across society – football legends, city leaders, politicians, the business community and the public – have come out to oppose the proposals and call for Scottish football to remain in Glasgow. The message has been clear, too, from our readers, more than 90pc of whom said in an Evening Times poll that they want the SFA to stay at Hampden. Of the decision, Henry added: “The SFA’s decision to remain at Hampden is fantastic for Scottish football and brilliant news for Glasgow. The city has been united in the fight to keep football at the famous stadium, and the Evening Times is delighted to have played its part through the Save the Hampden Roar campaign. Nice campaign but – looking at the picture they used – it reminds me of the old Wembley Stadium, which as majestic as it was (and I love the old stadiums, Elland Road and Goodison Park to name but two) it has clearly seen its day without a major revamp.